This weekend’s FA Cup meeting Chelsea and Bradford City was just two uncharacteristic Branislav Ivanovic mistakes away from being a rematch of the 2013 League Cup Final. Whilst, two years ago this month, Bradford City were overcoming considerable odds to defeat Aston Villa and book a place at Wembley, in the other semi final, Chelsea were on the wrong end of another cup surprise. Their two-legged affair against Swansea City was widely assumed to be a walk over, but a bad night for the Serbian defender caused Chelsea to lose 2-0 at home, and they failed to turn it around at the Liberty Stadium. A troubled season for the London club was denied the relief of a day out to the national stadium. Watching that second leg contest with Swansea at home on Sky that January evening – 24 hours after witnessing the greatest night in Bradford City’s history – I was willing the Blues to recover the tie and to be our League Cup Final opponents. In my head, I felt we had a better chance of lifting the silverware by facing the Blues rather than the Swans. It would have been less of a big deal to Chelsea and, at a time when they were deeply unpopular and still recovering from the turmoil of the John Terry-Anton Ferdinand episode, I thought the rest of the footballing world would be cheering us on even louder. Instead it was Swansea City who the Bantams faced, and the Welsh club – in their first-ever major cup final – were never going to take the day for granted. They were always going to treat City with the respect Wigan, Arsenal and Villa were evidently lacking. They were always going to give it their absolute best shot. Heck, a week before the Wembley meeting, manager Michael Laudrup even rested key players for a trip to Anfield. And though Chelsea had more talented and scary players, and though they would have inevitably have won the cup final against the League Two Bantams, it would have been a closer game. Unlike Swansea City, they would at least have let us have the ball. Four days after the Swansea date ended in disappointing if proud circumstances, I happened to find myself at Stamford Bridge as part of my day job, staying in the hotel that adjoins the Chelsea stadium. The evening before, the unpopular interim manager Rafa Benitez had blasted Chelsea supporters and the owner, Roman Abramovich, over the way they were treating him. As we made our way to our hotel that late morning, a Sky Sports News presenter was in situ by the ground, smelling the blood of a potential managerial sacking. With no news forthcoming, he resorted to vox-popping Chelsea supporters over whether they felt Benitez should be dismissed. He wasn’t fooled by our Northern accents or mick-taking shouts of support for the beleaguered Spaniard. Benitez’s outburst occurred during a post-match press conference at Middlesbrough that was supposed to be about discussing the fact he had just guided Chelsea to the quarter finals of the FA Cup – a competition where, just like the League Cup, they would bow out in the semi finals. Chelsea would go on to win the Europa League and finish third in the Premier League, thus qualifying for the Champions League the next year. Yet these were meagre returns for the reigning European Champions. We went for a drink in a fancy wine bar located within the Stamford Bridge complex (those prices, wow!) And early the morning after, myself and fellow WOAP writer Luke Lockwood embarked upon a lap around the perimeter of the stadium, peering through any gap and hole we could find to catch a glimpse of the pitch. We gawped in fascination at the giant, two-floor Chelsea club shop. Luke bought a souvenir to take home for a family member, and the person serving glanced at his Bradford City Wembley hoodie. 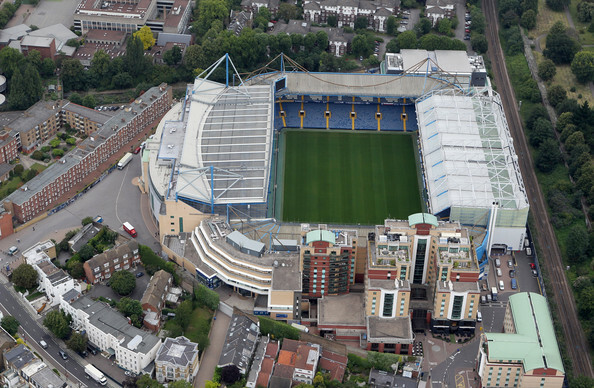 My one and only visit to Stamford Bridge for a match occurred in November 1999. It was Bradford City’s first Premier League season, Sky Sports had selected our trip to Chelsea as their ‘Super Sunday’ showing. We travelled down on a supporters coach, gasped at having to pay £3 for a matchday programme, and stared in bemusement at the number of fancy restaurants near the ground, all heavily populated by people wearing replica Chelsea shirts. You don’t get scenes like this on Manningham Lane. Back then Chelsea were good but far from world beaters. Gianfranco Zola and Tore Andre Flo led their attack that afternoon, the midfield and defence included World Cup winners Didier Deschamps and Marcel Desailly. A young centre back named John Terry was on the fringes of the first team. Robert Wolleaston was a week away from his one and only Premier League appearance. 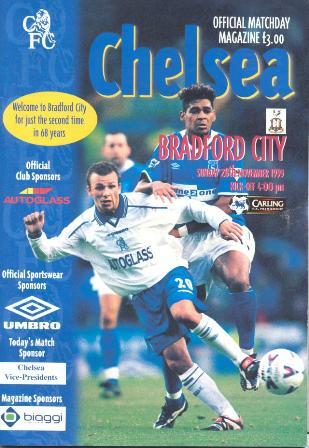 Chelsea – 1-0 winners over the Bantams that day – would go on to finish fifth, winning the FA Cup as a bonus. Within three-and-a-half years, they would be on the verge of financial meltdown. Enter Roman Abramovich, in 2003, and the most significant ownership change in the modern history of English football. The Russian billionaire’s motives for owning Chelsea have never been made clear; but whether a hobby or political, the 48-year-old has certainly not been shy of throwing his money at the club. Eye-watering levels of spending have transformed their fortunes forever. Chelsea might now have credible rivals for the world’s richest club, but for a time they were unmatched. Still, it took the arrival of a coach who called himself The Special One for the good times to truly arrive. Exactly a decade ago, Chelsea were on their way to a first English title in 50 years. Jose Mourinho was the man who led them to glory, and repeated the trick a year later. Abramovich’s beaming face of pride was a regular fixture on our TV screens. It was a seemingly perfect marriage. But then in 2007 Mourinho was sacked after falling out with Abramovich. Rafa Benitez’s February 2013 rant was that of a dead man walking. He knew that his time at the club was going to be fleeting. That after his association with Liverpool and rivalry with Mourinho, Chelsea fans were never going to accept him as the manager. He just about kept his dignity, proved a few people wrong with Chelsea’s double silverware success, and left the manager’s seat for the one man who, under Abramovich, had filled it with confidence and assurance. While Bradford City were making a much happier return to Wembley and earning promotion to League One, the national media was busying itself ramping up the speculation that Mourinho was about to return to Chelsea. It was claimed the Real Madrid coach was desperate to earn the nod of Sir Alex Ferguson’s successor at Old Trafford, but was overlooked. With no future at the Bernabeu, and with an old employer realising how much he missed him, Mourinho returned to Stamford Bridge. This time he called himself The Happy One. Whatever you think of Mourinho as a person, his managerial record is astonishing. Seven domestic league titles in England, Spain, Portugal and Italy. Twice he has won the Champions League. 15 assorted manager of the year awards. He is up their with the greatest. And yet, when Mourinho returned to Chelsea in the summer of 2013, he had just completed his first season in 12 years without his team winning a trophy. Just as Benitez was unloved on Kings Road, Mourinho wasn’t winning any popularity awards at Real Madrid. His aura was fading, and a less than satisfactory first season back at the Bridge also proved fruitless. Last season, Chelsea fell short and left Liverpool and Man City to battle over the title. Mourinho spent much of the season looking grumpy and depressed, perplexed over what to do about Fernando Torres. The 2014 close season was different. Mourinho was given access to Abramovich’s millions once more. Cesc Fabregas and Diego Costa, £62 million spent – you could buy James Hanson 8,267 times over for that money. The pair, plus the return of the impressive Nemanja Matic and first team promotion of Thibaut Courtois, have given Chelsea greater purpose across the pitch. Backing up the forward line are Loic Remy and the legendary Didier Drogba, who has returned after two years in Turkey. They began the season with a 3-1 victory over Burnley and have set the pace at the top all season. Recent form has suggested they are not the outstanding team some hoped, but they remain firm favourites to win the Premier League title. And with solid progress in the Champions League and a two-legged League Cup Final with Liverpool, Chelsea have seemingly returned and surpassed the level they were at under Rafa Benitez two years ago. Mourinho genuinely does look like The Happy One. Fabregas and Costa are frightening. Terry and Cahill are the best centre back pairing in the country. Chelsea’s season looks destined to have a happy ending. Which begs the question of what they hope and expect from this weekend’s FA Cup meeting with a League One club. Sandwiched in-between the Liverpool semi final and with a visit of title rivals Manchester City the following Saturday, is this game an opportunity to rest key players for more important battles ahead? Indeed, the way in which Phil Parkinson’s Bradford City now take cup competitions so seriously could almost be lifted from a manual written by Mourinho. The Portuguese’s first Chelsea trophy was a League Cup triumph over Liverpool in Cardiff, which helped to build momentum on route to their Premier League title triumph. In this season’s League Cup, Chelsea have fielded strong teams and been ruthless throughout. Just as it is impossible to separate Bradford City’s 2012/13 promotion from the League Cup glory nights against Arsenal and co, success breeds success and Mourinho understands that. Facing the Bantams on Saturday won’t be Chelsea’s strongest line-up of the season, but it will be one that is constructed and equipped to guide the club into the fifth round. Anything less could disrupt their season. You have to go back to 2008/09 for the last time they lost a cup tie to lower league opposition – second tier Burnley on penalties, when they were having a dodgy spell under Luiz Felipe Scolari. The season before that, Avram Grant oversaw an embarrassing 1-0 FA Cup loss to Championship Barnsley. The last time they lost a cup game at home to a lower league club that wasn’t on penalties? Huddersfield Town, back in that 1999/00 season when I and a couple of thousand City fans went to Stamford Bridge for a first-ever Premier League meeting. Back when Chelsea were a very different club. Never say never, but City are up against the very best that English football has to offer this weekend. It will be a mammoth task to cause an upset, it will be a miracle even to force a replay back at Valley Parade. Although unlike two years ago when we almost played Chelsea but instead faced Swansea, hopefully this time it will at least prove to be a closer affair. That was a lovely article. I think Mourinho lacks grace, but I do have a sneaking liking for him. You do not mention the game early in 2000 season when City comprehensively beat Chelsea, and reached a peak that night from which they immediately fell. I truly thought that night that the dream might be coming true. It didn’t, it turned into a nightmare. I hope you have a wonderful day on Saturday, and the team acquits itself well——dare we dream? I remember driving down to the 1-0 reversal in 1999 you mentioned Jason, seem to remember we weren’t too bad and even had Lee Mills hitting the bar. As we left wondering why we had come all this way when we could have watched on TV, all we could hear were Chelsea fans moaning that they hadn’t battered us. Let’s hope they are saying the same (or worse) on Saturday night.